Stress can cause a variety of reactions in women. 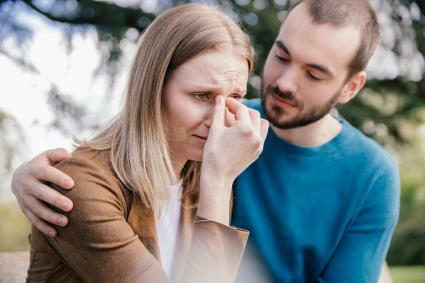 Men and women exhibit stress differently partly based on how they were raised and taught how to cope as well as what society typically deems as an appropriate response. Some research also indicates that women experience stress hormones and physical responses to stress differently than men. Women process emotions differently than men do. According to research, women were able to recall memories that were tied to positive and negative events better than men. With more vivid memory recall, woman are at a higher risk of experiencing rumination compared to men. Excessive rumination can lead to feelings of sadness, hopelessness, and for some, even depression. This means that she may want to talk about the stressful situation several times before feeling ready to move on and she's at a higher risk of getting stuck in the same thought process loop. Women will also tend to react differently to men when it comes to physical manifestations of stress. When women are stressed, their bodies tend to release higher amounts of oxytocin, which can trigger the "tend and befriend" response. Women may experience migraines and tension headaches because of stress more than men. Women also report experiencing gastrointestinal issues and crying spells due to stress at a higher rate than men. Listen to and validate her emotions. Ask what her what she needs from you during this time. See if you can make her a special dinner or pick up a goodie for her. Offer affection or a gentle touch if that's okay with her. See if she'd like to go for a walk with you. Ask if she would like to be left alone to process her feelings. If your friend or loved one is feeling stressed, take time to let her process how she's feeling. Reach out and provide support while giving space to take care of herself. Keep in mind that stress is temporary, and the intensity tends to peak and fade like a bell curve.